It is 1984 and a small town somewhere in the east of the Czechoslovak Socialist Republic is in the firm grip of totalitarianism. Karolina, a teenage runaway who never knew her father and who grew up in an untraditional family full of strange women, discovers a riding school on the edge of town. There, she gets to know the physically handicapped Romana and Matilda, a rider and trainer. Matlida begins to coach the two girls in the art of trick riding, an almost unknown sporting discipline, and they found a successful trick riding team. 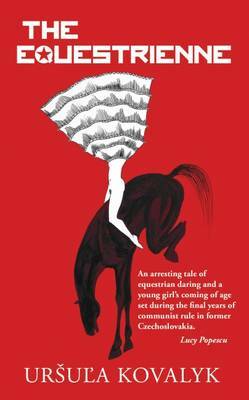 However, the fall of the Iron Curtain in 1989 and the subsequent arrival of capitalism threatens to destroy the riding school. With dictatorship of the proletariat being replaced by the dictatorship of money, the team has to turn professional and the girls are expected to be absolutely perfect in their performances. All of a sudden there is no room there for the physically handicapped Romana and the unruly Karolina...The Equestrienne is a novel about the desire to realise one's girlish dreams in spite of totalitarianism; it is a celebration of friendship between women and also a bitter acknowledgement that the desire for power can destroy any relationship.